Melt the white chocolate and set it aside to cool. Prepare gelatin by sprinkling over soursop puree. Whip egg yolks and sugar until it reaches a creamy consistency. Whip whites and sugar to medium peaks. Heat the soursop and the gelatin mixture until gelatin is melted. Combine chocolate, black sapote and soursop. Fold in yolk mixture and add the egg whites. Add your mixture to a mold or a dessert bowl. Chill your Mousse and enjoy! Blend all ingredients in a food processor then pour into a prepared pie shell with a chocolate graham cracker crust. Decorate pie surface with thin slices of mango or with sliced Kiwi. 2/3 cup frozen or fresh guanabana pulp (fresh is beter). Cut your fresh fruit in half and be sure to remove all the seeds. Remove and scoop fresh pulp from fruit or break of about the same amount from a frozen block of guanabana. In a blender, pour all the above ingredients except for the ice. Blend your ingredients until smooth. Add crushed ice and blend one more time until your milkshake has a thick smooth consistency. Serve right after blending and enjoy! Drink more than one and you will most likely feel very sleepy. Guanabana, Soursop, Graviola is well respected in alleviating migraine headache, diarrhea, cough, back pain, stress, high blood pressure, and nerve ailments. 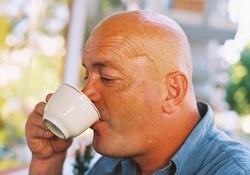 If you are suffering from insomnia, consider preparing some tea before going to bed. The tree is also widely believed to help people recover from cancer and used as a cancer prevention strategy. 1. Clean 2 - 3 small or 2 large organic pesticide free soursop leaves. 2. Boil about 1 1/2 cups of water. 3. Tear apart the soursop leaves into small pieces using your fingers or cut with scissors. 4. 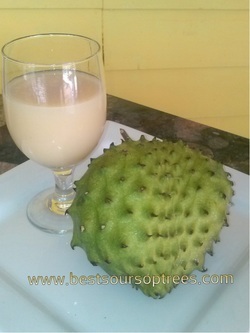 Place the Guanabana, Gravoila, Soursop leaves in your tea cup and pour the boiling water on them. Your next step is to then cover for 30 minutes. 5. Strain your tea and add agave sweetener, stevia, brown sugar, honey or other natural sweetener if you have a sweet tooth. 6. Drink warm or cold. * Disclaimer: Do not change or discontinue any medication or treatment without consulting your physician. These statements have not been evaluated by the US Food and Drug Administration. This information is not intended to diagnose, treat, cure or prevent any disease. Drink at your own risk and let your healthcare professional know what alternative health remedies you are considering before drinking any herbs or using any plant leaf as a food, tea or remedy!